Hide this Project (Man Opus) Discover properties in other projects by hiding the ones that doesn't interest you. You won't see them in your searches further but you can unhide anytime later. Hide this Dealer (Prop Pioneer LLP)Discover properties by other dealers by hiding those whom you have already spoken to. You won't see them in your searches further but you can unhide anytime later. Hide this Dealer (Investors Hub)Discover properties by other dealers by hiding those whom you have already spoken to. You won't see them in your searches further but you can unhide anytime later. Hide this Dealer (Shree Balaji Real Touch)Discover properties by other dealers by hiding those whom you have already spoken to. You won't see them in your searches further but you can unhide anytime later. Hide this Dealer (Khalil Khan) Discover properties by other dealers by hiding those whom you have already spoken to. You won't see them in your searches further but you can unhide anytime later. Hide this Dealer (Balaji Estate Consultancy)Discover properties by other dealers by hiding those whom you have already spoken to. You won't see them in your searches further but you can unhide anytime later. Man Opus in Mira Road East, Mira Road And Beyond by Shrusti Builders is a residential project. The size of the Apartment ranges in between 355.21 sq.ft. and 548.96 sq.ft. The size of the Studio Apartment is 161.46 sq.ft..
Man Opus price ranges from 55.00 Lacs to 1.00 Cr. Man Opus offers facilities such as Gymnasium and Lift. It also offers services like Banquet hall, Community hall and Library. This is a RERA registered project with registration number P51700008395. Bank loan approved from HDFC home loans, State Bank of India and IDBI Bank Ltd. It is an under construction project with possession offered in Aug, 2019. The project is spread over a total area of 2.76 acres of land. Man Opus has a total of 8 towers. The construction is of 23 floors. An accommodation of 1252 units has been provided. What is the project location?The project is located at Mira Road East, Mira Road And Beyond. What apartment sizes are available in Man Opus? The project offers apartments sized between 463.0 sqft and 1075.0 sqft. 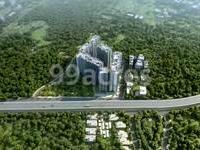 How much is area of 2bhk in Man Opus? Two-room units (2BHK) in the project are available in an area of 545.0 sqft to 1075.0 sqft. How much is the actual area of Man Opus?The area of the project is 2.76 Acres. What is the 1 bedroom price in Man Opus? 1 BHK units in the project are priced at Rs. 5500000 to Rs. 7226256. A Chennai-based real estate developer, Shrusti Builders and Developers is a well-known realty organization in south India. Shrusti is one of the rare builders, who takes into considerations environmental issues and creates homes that are environment conducive for a healthy living. Focused on developing grand residential spaces, the builders have been working rigorously in order to fulfill the dreams if thousands of end users. es. Every residential project that they undertake are a reflection of their dedication and commitment. Whether it is an appropriate location, grand architecture, robust infrastructure or immaculate designs ? the projects offer all of them. Completed projects of Shrusthi Builders include names like Vandhana, Vidhula and Vaishali. I appreciate man realty for developing their projects at the strategic location. Also, the quality of construction and the facilities offered at such low price is a dream come true for middle class home-buyers. Buying a home with MAN Realty is a value-for-money investment as they construct location friendly, quality homes and the latest amenities are offered at low price. I had a great experience while booking my new home with Man Realty at Man Opus, Mira Road. MAN Opus has good advantages in terms of Amenities and Location Amenities: Club House, Swimming Pool, Yoga Center, Kids play area, Library and more. Location wise it is strategically located close to railway station, highway, hospitals, schools, colleges and more. I would prefer to invest in MAN Opus.